Written by Christopher Beaubien • February 02, 2009 • Start the Discussion! One of the most painful moments in The Wrestler is when the doctor explains to Randy “The Ram” Robinson (Mickey Rourke) after his heart attack that he must not exert himself. The aging, muscular man is devastated and cries out, “Doc! I’m a professional wrestler!” The key word there is professional. He takes it seriously. It defines him. Being stripped of his identity, Randy feels worthless. He has never thought about the long term. His lost years of celebrity, drug use and promiscuity left him devoid of anyone who really care about him. Now, Randy is finally going to feel the emotional punishment he has spent his life numbing by punishing himself in the ring. Why do I love Randy “The Ram” Robinson? Because after sleeping in the back of his van, he has the good spirit to humour the kids knocking outside his window with some horseplay. Because he is a good sport when he choreographs a wrestling match involving a staple gun being used on him. Because he really does love Cassidy (Marisa Tomei), that sweet woman who works at the strip joint he often frequents. Because he is a good sport when he choreographs having a staple gun used on him during a match. Because when Randy picks out a jacket with the letter “S” for his justifiably resentful daughter Stephanie (Evan Rachel Wood), he really thinks she’ll like it. Because Randy hates himself for screwing up the good things that come his way. I can’t hate a man who already hates himself so much. Mickey Rourke plays this character as if he atoning for sins for which he cannot forgive himself. Watch how Rourke has Randy force himself to smile and not cry when Cassidy swills the rest of her beer down. Sizing up Rourke, Marisa Tomei as Cassidy stomachs so much pain here, whether she exposes her body and is passed over by customers or how she just can’t bear to watch Randy punish himself. Back in 2005, Rourke played a brutish lug named Marv in the comic-adaptation of Sin City. That character’s dialogue and scarred face were the stuff of pulp. Marv is an extension to Randy, a very sad avenger who nurses romantic fantasies. The closest Marv gets to a confession is when he confides his trouble with love. “I couldn’t even buy a woman… the way I look.” Mickey cut a big slab of himself off that meaty character and named him “The Ram”. Rourke found his match with director Darren Aronofsky who has overseen some searingly painful depictions of human agony in films like Pi (1998) and Requiem for a Dream (2000). Here Aronofsky tones down his trademark visual kinetics and opts for a down-ground documentary aesthetic. The scene where Randy gets treated for each injury and we double back to the previous fight to see how he got it is a gutsy stroke of genius. We aren’t denied the groan-inducing flaws that have endured Randy, which have left him with no one to care for him. How ironic for such a great showman. The wrestling matches have been planned ahead, right down to the concealed razor blade Randy uses on himself to really bleed for his cheering audience. The Wrestler is well photographed by Maryse Alberti whose camera finds interesting angles like that establishing shot outside the supermarket with a parking lot lamp at the right side that looks too close for comfort. The camera work is mostly hands-on, deprived of luxuries like tripods and cranes, we become ingrained in the sluggish velocity of Randy’s days. The wavering framing of Randy leaving the hospital in long shot is the most prominent example here. As a loving tribute, from the finger-smudged photographs to the retro font of the main title sequence expressing vintage 1980s sensibilities when Randy was in his prime. So long ago and impossible to let go off. Like gripped razor wire, it is embedded into flesh for good. I am drawn to movies about people living close on the edge. As the song says, suicide is painless, but Randy isn’t afraid of all that pain. 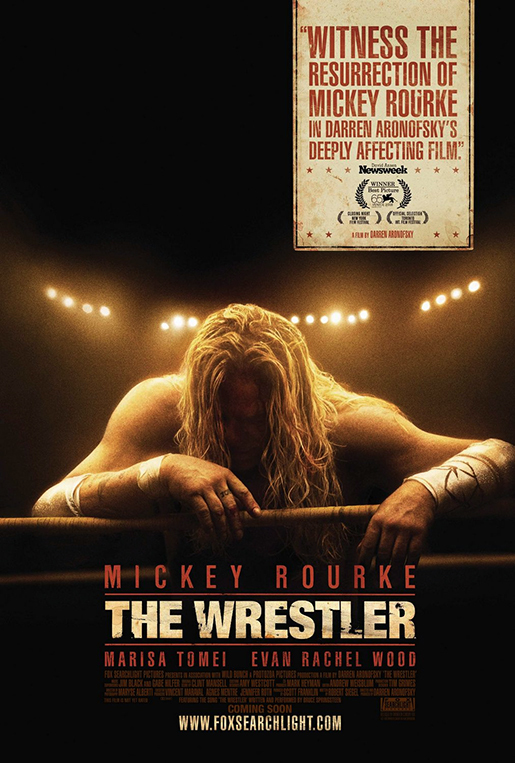 The Wrestler is a demanding and devastating experience. language and some drug use.